This article is about the astronomical objects. For other uses, see Comet (disambiguation). 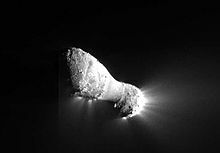 A comet is an icy, small Solar System body that, when passing close to the Sun, warms and begins to release gases, a process called outgassing. This produces a visible atmosphere or coma, and sometimes also a tail. These phenomena are due to the effects of solar radiation and the solar wind acting upon the nucleus of the comet. Comet nuclei range from a few hundred metres to tens of kilometres across and are composed of loose collections of ice, dust, and small rocky particles. The coma may be up to 15 times the Earth's diameter, while the tail may stretch one astronomical unit. If sufficiently bright, a comet may be seen from the Earth without the aid of a telescope and may subtend an arc of 30° (60 Moons) across the sky. Comets have been observed and recorded since ancient times by many cultures. Comets usually have highly eccentric elliptical orbits, and they have a wide range of orbital periods, ranging from several years to potentially several millions of years. Short-period comets originate in the Kuiper belt or its associated scattered disc, which lie beyond the orbit of Neptune. Long-period comets are thought to originate in the Oort cloud, a spherical cloud of icy bodies extending from outside the Kuiper belt to halfway to the nearest star. Long-period comets are set in motion towards the Sun from the Oort cloud by gravitational perturbations caused by passing stars and the galactic tide. Hyperbolic comets may pass once through the inner Solar System before being flung to interstellar space. The appearance of a comet is called an apparition. Comets are distinguished from asteroids by the presence of an extended, gravitationally unbound atmosphere surrounding their central nucleus. This atmosphere has parts termed the coma (the central part immediately surrounding the nucleus) and the tail (a typically linear section consisting of dust or gas blown out from the coma by the Sun's light pressure or outstreaming solar wind plasma). However, extinct comets that have passed close to the Sun many times have lost nearly all of their volatile ices and dust and may come to resemble small asteroids. Asteroids are thought to have a different origin from comets, having formed inside the orbit of Jupiter rather than in the outer Solar System. The discovery of main-belt comets and active centaur minor planets has blurred the distinction between asteroids and comets. In the early 21st century, the discovery of some minor bodies with long-period comet orbits, but characteristics of inner solar system asteroids, were called Manx comets. They are still classified as comets, such as C/2014 S3 (PANSTARRS). 27 Manx comets were found from 2013 to 2017. As of July 2018[update] there are 6,339 known comets, a number that is steadily increasing as they are discovered. However, this represents only a tiny fraction of the total potential comet population, as the reservoir of comet-like bodies in the outer Solar System (in the Oort cloud) is estimated to be one trillion. Roughly one comet per year is visible to the naked eye, though many of those are faint and unspectacular. Particularly bright examples are called "great comets". Comets have been visited by unmanned probes such as the European Space Agency's Rosetta, which became the first ever to land a robotic spacecraft on a comet, and NASA's Deep Impact, which blasted a crater on Comet Tempel 1 to study its interior. A comet was mentioned in the Anglo-Saxon Chronicle that allegedly made an appearance in 729 AD. The word comet derives from the Old English cometa from the Latin comēta or comētēs. That, in turn, is a latinisation of the Greek κομήτης ("wearing long hair"), and the Oxford English Dictionary notes that the term (ἀστὴρ) κομήτης already meant "long-haired star, comet" in Greek. Κομήτης was derived from κομᾶν ("to wear the hair long"), which was itself derived from κόμη ("the hair of the head") and was used to mean "the tail of a comet". The astronomical symbol for comets is ☄ (in Unicode U+2604), consisting of a small disc with three hairlike extensions. Nucleus of 103P/Hartley as imaged during a spacecraft flyby. The nucleus is about 2 km in length. The solid, core structure of a comet is known as the nucleus. Cometary nuclei are composed of an amalgamation of rock, dust, water ice, and frozen carbon dioxide, carbon monoxide, methane, and ammonia. As such, they are popularly described as "dirty snowballs" after Fred Whipple's model. However, some comets may have a higher dust content, leading them to be called "icy dirtballs". Research conducted in 2014 suggests that comets are like "deep fried ice cream", in that their surfaces are formed of dense crystalline ice mixed with organic compounds, while the interior ice is colder and less dense. 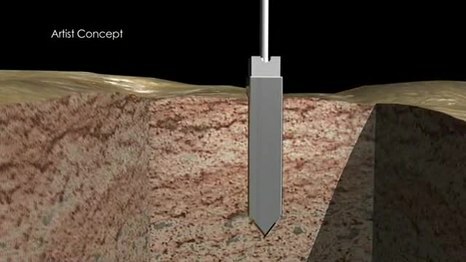 The surface of the nucleus is generally dry, dusty or rocky, suggesting that the ices are hidden beneath a surface crust several metres thick. In addition to the gases already mentioned, the nuclei contain a variety of organic compounds, which may include methanol, hydrogen cyanide, formaldehyde, ethanol, and ethane and perhaps more complex molecules such as long-chain hydrocarbons and amino acids. In 2009, it was confirmed that the amino acid glycine had been found in the comet dust recovered by NASA's Stardust mission. In August 2011, a report, based on NASA studies of meteorites found on Earth, was published suggesting DNA and RNA components (adenine, guanine, and related organic molecules) may have been formed on asteroids and comets. The outer surfaces of cometary nuclei have a very low albedo, making them among the least reflective objects found in the Solar System. The Giotto space probe found that the nucleus of Halley's Comet reflects about four percent of the light that falls on it, and Deep Space 1 discovered that Comet Borrelly's surface reflects less than 3.0%; by comparison, asphalt reflects seven percent. The dark surface material of the nucleus may consist of complex organic compounds. Solar heating drives off lighter volatile compounds, leaving behind larger organic compounds that tend to be very dark, like tar or crude oil. The low reflectivity of cometary surfaces causes them to absorb the heat that drives their outgassing processes. Comet nuclei with radii of up to 30 kilometres (19 mi) have been observed, but ascertaining their exact size is difficult. The nucleus of 322P/SOHO is probably only 100–200 metres (330–660 ft) in diameter. A lack of smaller comets being detected despite the increased sensitivity of instruments has led some to suggest that there is a real lack of comets smaller than 100 metres (330 ft) across. Known comets have been estimated to have an average density of 0.6 g/cm3 (0.35 oz/cu in). Because of their low mass, comet nuclei do not become spherical under their own gravity and therefore have irregular shapes. Roughly six percent of the near-Earth asteroids are thought to be extinct nuclei of comets that no longer experience outgassing, including 14827 Hypnos and 3552 Don Quixote. Results from the Rosetta and Philae spacecraft show that the nucleus of 67P/Churyumov–Gerasimenko has no magnetic field, which suggests that magnetism may not have played a role in the early formation of planetesimals. Further, the ALICE spectrograph on Rosetta determined that electrons (within 1 km (0.62 mi) above the comet nucleus) produced from photoionization of water molecules by solar radiation, and not photons from the Sun as thought earlier, are responsible for the degradation of water and carbon dioxide molecules released from the comet nucleus into its coma. Instruments on the Philae lander found at least sixteen organic compounds at the comet's surface, four of which (acetamide, acetone, methyl isocyanate and propionaldehyde) have been detected for the first time on a comet. The streams of dust and gas thus released form a huge and extremely thin atmosphere around the comet called the "coma". The force exerted on the coma by the Sun's radiation pressure and solar wind cause an enormous "tail" to form pointing away from the Sun. 2O parent molecule is destroyed primarily through photodissociation and to a much smaller extent photoionization, with the solar wind playing a minor role in the destruction of water compared to photochemistry. Larger dust particles are left along the comet's orbital path whereas smaller particles are pushed away from the Sun into the comet's tail by light pressure. Although the solid nucleus of comets is generally less than 60 kilometres (37 mi) across, the coma may be thousands or millions of kilometres across, sometimes becoming larger than the Sun. For example, about a month after an outburst in October 2007, comet 17P/Holmes briefly had a tenuous dust atmosphere larger than the Sun. The Great Comet of 1811 also had a coma roughly the diameter of the Sun. Even though the coma can become quite large, its size can decrease about the time it crosses the orbit of Mars around 1.5 astronomical units (220,000,000 km; 140,000,000 mi) from the Sun. At this distance the solar wind becomes strong enough to blow the gas and dust away from the coma, and in doing so enlarging the tail. Ion tails have been observed to extend one astronomical unit (150 million km) or more. 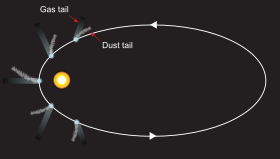 Both the coma and tail are illuminated by the Sun and may become visible when a comet passes through the inner Solar System, the dust reflects sunlight directly while the gases glow from ionisation. 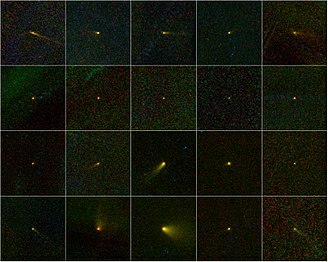 Most comets are too faint to be visible without the aid of a telescope, but a few each decade become bright enough to be visible to the naked eye. Occasionally a comet may experience a huge and sudden outburst of gas and dust, during which the size of the coma greatly increases for a period of time. This happened in 2007 to Comet Holmes. In 1996, comets were found to emit X-rays. This greatly surprised astronomers because X-ray emission is usually associated with very high-temperature bodies. The X-rays are generated by the interaction between comets and the solar wind: when highly charged solar wind ions fly through a cometary atmosphere, they collide with cometary atoms and molecules, "stealing" one or more electrons from the atom in a process called "charge exchange". This exchange or transfer of an electron to the solar wind ion is followed by its de-excitation into the ground state of the ion by the emission of X-rays and far ultraviolet photons. Bow shocks form at as a result of the interaction between the solar wind and the cometary ionosphere, which is created by ionization of gases in the coma. As the comet approaches the Sun, increasing outgassing rates cause the coma to expand, and the sunlight ionizes gases in the coma. When the solar wind passes through this ion coma, the bow shock appears. The first observations were made in the 1980s and 90s as several spacecraft flew by comets 21P/Giacobini–Zinner, 1P/Halley, and 26P/Grigg–Skjellerup. It was then found that the bow shocks at comets are wider and more gradual than the sharp planetary bow shocks seen at, for example, Earth. These observations were all made near perihelion when the bow shocks already were fully developed. The Rosetta spacecraft observed the bow shock at comet 67P/Churyumov–Gerasimenko at an early stage of bow shock development when the outgassing increased during the comet's journey toward the Sun. This young bow shock was called the "infant bow shock". The infant bow shock is asymmetric and, relative to the distance to the nucleus, wider than fully developed bow shocks. In the outer Solar System, comets remain frozen and inactive and are extremely difficult or impossible to detect from Earth due to their small size. Statistical detections of inactive comet nuclei in the Kuiper belt have been reported from observations by the Hubble Space Telescope but these detections have been questioned. As a comet approaches the inner Solar System, solar radiation causes the volatile materials within the comet to vaporize and stream out of the nucleus, carrying dust away with them. The streams of dust and gas each form their own distinct tail, pointing in slightly different directions. The tail of dust is left behind in the comet's orbit in such a manner that it often forms a curved tail called the type II or dust tail. At the same time, the ion or type I tail, made of gases, always points directly away from the Sun because this gas is more strongly affected by the solar wind than is dust, following magnetic field lines rather than an orbital trajectory. On occasions—such as when the Earth passes through a comet's orbital plane, the antitail, pointing in the opposite direction to the ion and dust tails, may be seen. 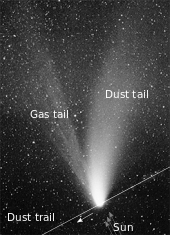 Diagram of a comet showing the dust trail, the dust tail, and the ion gas tail formed by solar wind. The observation of antitails contributed significantly to the discovery of solar wind. The ion tail is formed as a result of the ionisation by solar ultra-violet radiation of particles in the coma. Once the particles have been ionized, they attain a net positive electrical charge, which in turn gives rise to an "induced magnetosphere" around the comet. The comet and its induced magnetic field form an obstacle to outward flowing solar wind particles. Because the relative orbital speed of the comet and the solar wind is supersonic, a bow shock is formed upstream of the comet in the flow direction of the solar wind. 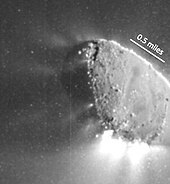 In this bow shock, large concentrations of cometary ions (called "pick-up ions") congregate and act to "load" the solar magnetic field with plasma, such that the field lines "drape" around the comet forming the ion tail. If the ion tail loading is sufficient, the magnetic field lines are squeezed together to the point where, at some distance along the ion tail, magnetic reconnection occurs. This leads to a "tail disconnection event". This has been observed on a number of occasions, one notable event being recorded on 20 April 2007, when the ion tail of Encke's Comet was completely severed while the comet passed through a coronal mass ejection. This event was observed by the STEREO space probe. In 2013, ESA scientists reported that the ionosphere of the planet Venus streams outwards in a manner similar to the ion tail seen streaming from a comet under similar conditions." Uneven heating can cause newly generated gases to break out of a weak spot on the surface of comet's nucleus, like a geyser. These streams of gas and dust can cause the nucleus to spin, and even split apart. In 2010 it was revealed dry ice (frozen carbon dioxide) can power jets of material flowing out of a comet nucleus. 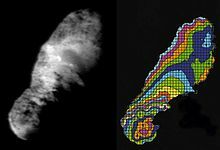 Infrared imaging of Hartley 2 shows such jets exiting and carrying with it dust grains into the coma. Most comets are small Solar System bodies with elongated elliptical orbits that take them close to the Sun for a part of their orbit and then out into the further reaches of the Solar System for the remainder. Comets are often classified according to the length of their orbital periods: The longer the period the more elongated the ellipse. Periodic comets or short-period comets are generally defined as those having orbital periods of less than 200 years. They usually orbit more-or-less in the ecliptic plane in the same direction as the planets. Their orbits typically take them out to the region of the outer planets (Jupiter and beyond) at aphelion; for example, the aphelion of Halley's Comet is a little beyond the orbit of Neptune. Comets whose aphelia are near a major planet's orbit are called its "family". Such families are thought to arise from the planet capturing formerly long-period comets into shorter orbits. At the shorter orbital period extreme, Encke's Comet has an orbit that does not reach the orbit of Jupiter, and is known as an Encke-type comet. Short-period comets with orbital periods less than 20 years and low inclinations (up to 30 degrees) to the ecliptic are called traditional Jupiter-family comets (JFCs). Those like Halley, with orbital periods of between 20 and 200 years and inclinations extending from zero to more than 90 degrees, are called Halley-type comets (HTCs). As of 2019[update], 85 HTCs have been observed, compared with 664 identified JFCs. Recently discovered main-belt comets form a distinct class, orbiting in more circular orbits within the asteroid belt. Because their elliptical orbits frequently take them close to the giant planets, comets are subject to further gravitational perturbations. Short-period comets have a tendency for their aphelia to coincide with a giant planet's semi-major axis, with the JFCs being the largest group. It is clear that comets coming in from the Oort cloud often have their orbits strongly influenced by the gravity of giant planets as a result of a close encounter. Jupiter is the source of the greatest perturbations, being more than twice as massive as all the other planets combined. These perturbations can deflect long-period comets into shorter orbital periods. 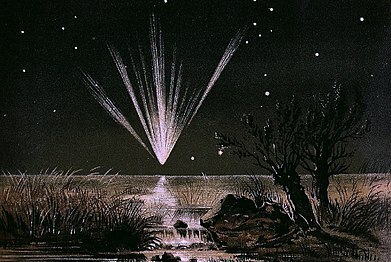 Based on their orbital characteristics, short-period comets are thought to originate from the centaurs and the Kuiper belt/scattered disc —a disk of objects in the trans-Neptunian region—whereas the source of long-period comets is thought to be the far more distant spherical Oort cloud (after the Dutch astronomer Jan Hendrik Oort who hypothesised its existence). Vast swarms of comet-like bodies are thought to orbit the Sun in these distant regions in roughly circular orbits. Occasionally the gravitational influence of the outer planets (in the case of Kuiper belt objects) or nearby stars (in the case of Oort cloud objects) may throw one of these bodies into an elliptical orbit that takes it inwards toward the Sun to form a visible comet. Unlike the return of periodic comets, whose orbits have been established by previous observations, the appearance of new comets by this mechanism is unpredictable. 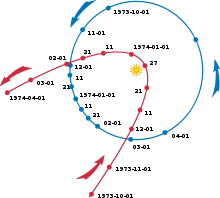 Orbits of Comet Kohoutek (red) and the Earth (blue), illustrating the high eccentricity of its orbit and its rapid motion when close to the Sun. Long-period comets have highly eccentric orbits and periods ranging from 200 years to thousands of years. An eccentricity greater than 1 when near perihelion does not necessarily mean that a comet will leave the Solar System. For example, Comet McNaught had a heliocentric osculating eccentricity of 1.000019 near its perihelion passage epoch in January 2007 but is bound to the Sun with roughly a 92,600-year orbit because the eccentricity drops below 1 as it moves farther from the Sun. The future orbit of a long-period comet is properly obtained when the osculating orbit is computed at an epoch after leaving the planetary region and is calculated with respect to the center of mass of the Solar System. By definition long-period comets remain gravitationally bound to the Sun; those comets that are ejected from the Solar System due to close passes by major planets are no longer properly considered as having "periods". The orbits of long-period comets take them far beyond the outer planets at aphelia, and the plane of their orbits need not lie near the ecliptic. Long-period comets such as Comet West and C/1999 F1 can have aphelion distances of nearly 70,000 AU with orbital periods estimated around 6 million years. Single-apparition or non-periodic comets are similar to long-period comets because they also have parabolic or slightly hyperbolic trajectories when near perihelion in the inner Solar System. However, gravitational perturbations from giant planets cause their orbits to change. Single-apparition comets have a hyperbolic or parabolic osculating orbit which allows them to permanently exit the Solar System after a single pass of the Sun. The Sun's Hill sphere has an unstable maximum boundary of 230,000 AU (1.1 parsecs (3.6 light-years)). Only a few hundred comets have been seen to reach a hyperbolic orbit (e > 1) when near perihelion that using a heliocentric unperturbed two-body best-fit suggests they may escape the Solar System. 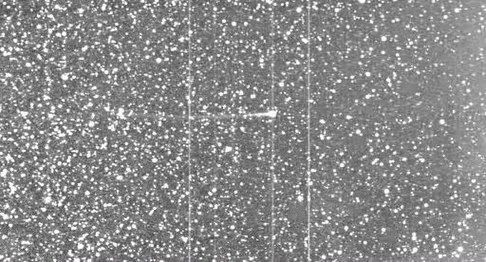 As of 2018, 1I/ʻOumuamua is the only object with an eccentricity significantly greater than one that has been detected, indicating an origin outside the Solar System. While ʻOumuamua showed no optical signs of cometary activity during its passage through the inner Solar System in October 2017, changes to its trajectory—which suggests outgassing—indicate that it is indeed a comet. Comet C/1980 E1 had an orbital period of roughly 7.1 million years before the 1982 perihelion passage, but a 1980 encounter with Jupiter accelerated the comet giving it the largest eccentricity (1.057) of any known hyperbolic comet. Comets not expected to return to the inner Solar System include C/1980 E1, C/2000 U5, C/2001 Q4 (NEAT), C/2009 R1, C/1956 R1, and C/2007 F1 (LONEOS). Some authorities use the term "periodic comet" to refer to any comet with a periodic orbit (that is, all short-period comets plus all long-period comets), whereas others use it to mean exclusively short-period comets. Similarly, although the literal meaning of "non-periodic comet" is the same as "single-apparition comet", some use it to mean all comets that are not "periodic" in the second sense (that is, to also include all comets with a period greater than 200 years). Early observations have revealed a few genuinely hyperbolic (i.e. non-periodic) trajectories, but no more than could be accounted for by perturbations from Jupiter. If comets pervaded interstellar space, they would be moving with velocities of the same order as the relative velocities of stars near the Sun (a few tens of km per second). If such objects entered the Solar System, they would have positive specific orbital energy and would be observed to have genuinely hyperbolic trajectories. A rough calculation shows that there might be four hyperbolic comets per century within Jupiter's orbit, give or take one and perhaps two orders of magnitude. The Oort cloud is thought to occupy a vast space starting from between 2,000 and 5,000 AU (0.03 and 0.08 ly) to as far as 50,000 AU (0.79 ly) from the Sun. Some estimates place the outer edge at between 100,000 and 200,000 AU (1.58 and 3.16 ly). The region can be subdivided into a spherical outer Oort cloud of 20,000–50,000 AU (0.32–0.79 ly), and a doughnut-shaped inner cloud, the Hills cloud, of 2,000–20,000 AU (0.03–0.32 ly). The outer cloud is only weakly bound to the Sun and supplies the long-period (and possibly Halley-type) comets that fall to inside the orbit of Neptune. 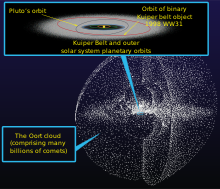 The inner Oort cloud is also known as the Hills cloud, named after J. G. Hills, who proposed its existence in 1981. Models predict that the inner cloud should have tens or hundreds of times as many cometary nuclei as the outer halo; it is seen as a possible source of new comets that resupply the relatively tenuous outer cloud as the latter's numbers are gradually depleted. The Hills cloud explains the continued existence of the Oort cloud after billions of years. Exocomets beyond the Solar System have also been detected and may be common in the Milky Way. The first exocomet system detected was around Beta Pictoris, a very young A-type main-sequence star, in 1987. A total of 10 such exocomet systems have been identified as of 2013[update], using the absorption spectrum caused by the large clouds of gas emitted by comets when passing close to their star. As a result of outgassing, comets leave in their wake a trail of solid debris too large to be swept away by radiation pressure and the solar wind. If the Earth's orbit sends it through that debris, there are likely to be meteor showers as Earth passes through. The Perseid meteor shower, for example, occurs every year between 9 and 13 August, when Earth passes through the orbit of Comet Swift–Tuttle. Halley's Comet is the source of the Orionid shower in October. Many comets and asteroids collided with Earth in its early stages. Many scientists think that comets bombarding the young Earth about 4 billion years ago brought the vast quantities of water that now fill the Earth's oceans, or at least a significant portion of it. Others have cast doubt on this idea. The detection of organic molecules, including polycyclic aromatic hydrocarbons, in significant quantities in comets has led to speculation that comets or meteorites may have brought the precursors of life—or even life itself—to Earth. In 2013 it was suggested that impacts between rocky and icy surfaces, such as comets, had the potential to create the amino acids that make up proteins through shock synthesis. In 2015, scientists found significant amounts of molecular oxygen in the outgassings of comet 67P, suggesting that the molecule may occur more often than had been thought, and thus less an indicator of life as has been supposed. It is suspected that comet impacts have, over long timescales, also delivered significant quantities of water to the Earth's Moon, some of which may have survived as lunar ice. Comet and meteoroid impacts are also thought to be responsible for the existence of tektites and australites. Fear of comets as acts of God and signs of impending doom was highest in Europe from AD 1200 to 1650. The year after the Great Comet of 1618, for example, Gotthard Arthusius published a pamphlet stating that it was a sign that the Day of Judgment was near. He listed ten pages of comet-related disasters, including "earthquakes, floods, changes in river courses, hail storms, hot and dry weather, poor harvests, epidemics, war and treason and high prices". By 1700 most scholars concluded that such events occurred whether a comet was seen or not. Using Edmund Halley's records of comet sightings, however, William Whiston in 1711 wrote that the Great Comet of 1680 had a periodicity of 574 years and was responsible for the worldwide flood in the Book of Genesis, by pouring water on the Earth. His announcement revived for another century fear of comets, now as direct threats to the world instead of signs of disasters. Spectroscopic analysis in 1910 found the toxic gas cyanogen in the tail of Halley's Comet, causing panicked buying of gas masks and quack "anti-comet pills" and "anti-comet umbrellas" by the public. If a comet is traveling fast enough, it may leave the Solar System. Such comets follow the open path of a hyperbola, and as such they are called hyperbolic comets. To date, comets are only known to be ejected by interacting with another object in the Solar System, such as Jupiter. An example of this is thought to be Comet C/1980 E1, which was shifted from a predicted orbit of 7.1 million years around the Sun, to a hyperbolic trajectory, after a 1980 close pass by the planet Jupiter. Jupiter-family comets and long-period comets appear to follow very different fading laws. The JFCs are active over a lifetime of about 10,000 years or ~1,000 orbits whereas long-period comets fade much faster. Only 10% of the long-period comets survive more than 50 passages to small perihelion and only 1% of them survive more than 2,000 passages. Eventually most of the volatile material contained in a comet nucleus evaporates, and the comet becomes a small, dark, inert lump of rock or rubble that can resemble an asteroid. Some asteroids in elliptical orbits are now identified as extinct comets. Roughly six percent of the near-Earth asteroids are thought to be extinct comet nuclei. The nucleus of some comets may be fragile, a conclusion supported by the observation of comets splitting apart. A significant cometary disruption was that of Comet Shoemaker–Levy 9, which was discovered in 1993. A close encounter in July 1992 had broken it into pieces, and over a period of six days in July 1994, these pieces fell into Jupiter's atmosphere—the first time astronomers had observed a collision between two objects in the Solar System. Other splitting comets include 3D/Biela in 1846 and 73P/Schwassmann–Wachmann from 1995 to 2006. Greek historian Ephorus reported that a comet split apart as far back as the winter of 372–373 BC. Comets are suspected of splitting due to thermal stress, internal gas pressure, or impact. Some comets have been observed to break up during their perihelion passage, including great comets West and Ikeya–Seki. Biela's Comet was one significant example, when it broke into two pieces during its passage through the perihelion in 1846. These two comets were seen separately in 1852, but never again afterward. Instead, spectacular meteor showers were seen in 1872 and 1885 when the comet should have been visible. A minor meteor shower, the Andromedids, occurs annually in November, and it is caused when the Earth crosses the orbit of Biela's Comet. Some comets meet a more spectacular end – either falling into the Sun or smashing into a planet or other body. Collisions between comets and planets or moons were common in the early Solar System: some of the many craters on the Moon, for example, may have been caused by comets. 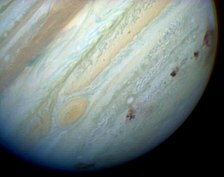 A recent collision of a comet with a planet occurred in July 1994 when Comet Shoemaker–Levy 9 broke up into pieces and collided with Jupiter. The names given to comets have followed several different conventions over the past two centuries. Prior to the early 20th century, most comets were simply referred to by the year when they appeared, sometimes with additional adjectives for particularly bright comets; thus, the "Great Comet of 1680", the "Great Comet of 1882", and the "Great January Comet of 1910". After Edmund Halley demonstrated that the comets of 1531, 1607, and 1682 were the same body and successfully predicted its return in 1759 by calculating its orbit, that comet became known as Halley's Comet. Similarly, the second and third known periodic comets, Encke's Comet and Biela's Comet, were named after the astronomers who calculated their orbits rather than their original discoverers. Later, periodic comets were usually named after their discoverers, but comets that had appeared only once continued to be referred to by the year of their appearance. In the early 20th century, the convention of naming comets after their discoverers became common, and this remains so today. A comet can be named after its discoverers, or an instrument or program that helped to find it. 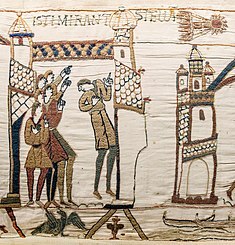 Halley's Comet appeared in 1066, prior to the Battle of Hastings, and is depicted in the Bayeux Tapestry. From ancient sources, such as Chinese oracle bones, it is known that comets have been noticed by humans for millennia. Until the sixteenth century, comets were usually considered bad omens of deaths of kings or noble men, or coming catastrophes, or even interpreted as attacks by heavenly beings against terrestrial inhabitants. Aristotle believed that comets were atmospheric phenomena, due to the fact that they could appear outside of the Zodiac and vary in brightness over the course of a few days. 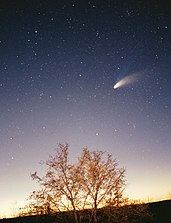 Pliny the Elder believed that comets were connected with political unrest and death. In India, by the 6th century astronomers believed that comets were celestial bodies that re-appeared periodically. This was the view expressed in the 6th century by the astronomers Varāhamihira and Bhadrabahu, and the 10th-century astronomer Bhaṭṭotpala listed the names and estimated periods of certain comets, but it is not known how these figures were calculated or how accurate they were. 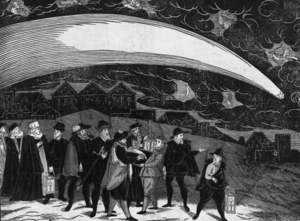 In the 16th century Tycho Brahe demonstrated that comets must exist outside the Earth's atmosphere by measuring the parallax of the Great Comet of 1577 from observations collected by geographically separated observers. Within the precision of the measurements, this implied the comet must be at least four times more distant than from the Earth to the Moon. Isaac Newton, in his Principia Mathematica of 1687, proved that an object moving under the influence of gravity must trace out an orbit shaped like one of the conic sections, and he demonstrated how to fit a comet's path through the sky to a parabolic orbit, using the comet of 1680 as an example. 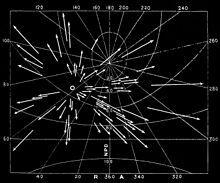 In 1705, Edmond Halley (1656–1742) applied Newton's method to twenty-three cometary apparitions that had occurred between 1337 and 1698. He noted that three of these, the comets of 1531, 1607, and 1682, had very similar orbital elements, and he was further able to account for the slight differences in their orbits in terms of gravitational perturbation caused by Jupiter and Saturn. Confident that these three apparitions had been three appearances of the same comet, he predicted that it would appear again in 1758–9. Halley's predicted return date was later refined by a team of three French mathematicians: Alexis Clairaut, Joseph Lalande, and Nicole-Reine Lepaute, who predicted the date of the comet's 1759 perihelion to within one month's accuracy. When the comet returned as predicted, it became known as Halley's Comet (with the latter-day designation of 1P/Halley). It will next appear in 2061. Isaac Newton described comets as compact and durable solid bodies moving in oblique orbit and their tails as thin streams of vapor emitted by their nuclei, ignited or heated by the Sun. Newton suspected that comets were the origin of the life-supporting component of air. To light up worlds, and feed th' ethereal fire. As early as the 18th century, some scientists had made correct hypotheses as to comets' physical composition. In 1755, Immanuel Kant hypothesized that comets are composed of some volatile substance, whose vaporization gives rise to their brilliant displays near perihelion. In 1836, the German mathematician Friedrich Wilhelm Bessel, after observing streams of vapor during the appearance of Halley's Comet in 1835, proposed that the jet forces of evaporating material could be great enough to significantly alter a comet's orbit, and he argued that the non-gravitational movements of Encke's Comet resulted from this phenomenon. In 1950, Fred Lawrence Whipple proposed that rather than being rocky objects containing some ice, comets were icy objects containing some dust and rock. This "dirty snowball" model soon became accepted and appeared to be supported by the observations of an armada of spacecraft (including the European Space Agency's Giotto probe and the Soviet Union's Vega 1 and Vega 2) that flew through the coma of Halley's Comet in 1986, photographed the nucleus, and observed jets of evaporating material. 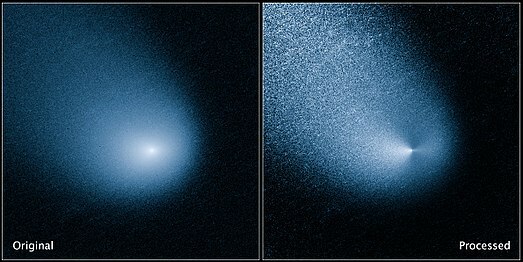 2CO, and dust inside the comae of comets C/2012 F6 (Lemmon) and C/2012 S1 (ISON). The Halley Armada describes the collection of spacecraft missions that visited and/or made observations of Halley's Comet 1980s perihelion. Deep Impact. Debate continues about how much ice is in a comet. In 2001, the Deep Space 1 spacecraft obtained high-resolution images of the surface of Comet Borrelly. It was found that the surface of comet Borrelly is hot and dry, with a temperature of between 26 to 71 °C (79 to 160 °F), and extremely dark, suggesting that the ice has been removed by solar heating and maturation, or is hidden by the soot-like material that covers Borrelly. In July 2005, the Deep Impact probe blasted a crater on Comet Tempel 1 to study its interior. The mission yielded results suggesting that the majority of a comet's water ice is below the surface and that these reservoirs feed the jets of vaporised water that form the coma of Tempel 1. Renamed EPOXI, it made a flyby of Comet Hartley 2 on 4 November 2010. Stardust. Data from the Stardust mission show that materials retrieved from the tail of Wild 2 were crystalline and could only have been "born in fire", at extremely high temperatures of over 1,000 °C (1,830 °F). Although comets formed in the outer Solar System, radial mixing of material during the early formation of the Solar System is thought to have redistributed material throughout the proto-planetary disk. As a result, comets also contain crystalline grains that formed in the early, hot inner Solar System. This is seen in comet spectra as well as in sample return missions. More recent still, the materials retrieved demonstrate that the "comet dust resembles asteroid materials". These new results have forced scientists to rethink the nature of comets and their distinction from asteroids. Rosetta. The Rosetta probe orbited Comet Churyumov–Gerasimenko. On 12 November 2014, its lander Philae successfully landed on the comet's surface, the first time a spacecraft has ever landed on such an object in history. Approximately once a decade, a comet becomes bright enough to be noticed by a casual observer, leading such comets to be designated as great comets. Predicting whether a comet will become a great comet is notoriously difficult, as many factors may cause a comet's brightness to depart drastically from predictions. Broadly speaking, if a comet has a large and active nucleus, will pass close to the Sun, and is not obscured by the Sun as seen from the Earth when at its brightest, it has a chance of becoming a great comet. However, Comet Kohoutek in 1973 fulfilled all the criteria and was expected to become spectacular but failed to do so. Comet West, which appeared three years later, had much lower expectations but became an extremely impressive comet. The late 20th century saw a lengthy gap without the appearance of any great comets, followed by the arrival of two in quick succession—Comet Hyakutake in 1996, followed by Hale–Bopp, which reached maximum brightness in 1997 having been discovered two years earlier. The first great comet of the 21st century was C/2006 P1 (McNaught), which became visible to naked eye observers in January 2007. It was the brightest in over 40 years. A sungrazing comet is a comet that passes extremely close to the Sun at perihelion, generally within a few million kilometres. Although small sungrazers can be completely evaporated during such a close approach to the Sun, larger sungrazers can survive many perihelion passages. However, the strong tidal forces they experience often lead to their fragmentation. About 90% of the sungrazers observed with SOHO are members of the Kreutz group, which all originate from one giant comet that broke up into many smaller comets during its first passage through the inner Solar System. The remainder contains some sporadic sungrazers, but four other related groups of comets have been identified among them: the Kracht, Kracht 2a, Marsden, and Meyer groups. The Marsden and Kracht groups both appear to be related to Comet 96P/Machholz, which is also the parent of two meteor streams, the Quadrantids and the Arietids. Centaurs typically behave with characteristics of both asteroids and comets. Centaurs can be classified as comets such as 60558 Echeclus, and 166P/NEAT. 166P/NEAT was discovered while it exhibited a coma, and so is classified as a comet despite its orbit, and 60558 Echeclus was discovered without a coma but later became active, and was then classified as both a comet and an asteroid (174P/Echeclus). One plan for Cassini involved sending it to a centaur, but NASA decided to destroy it instead. A comet may be discovered photographically using a wide-field telescope or visually with binoculars. However, even without access to optical equipment, it is still possible for the amateur astronomer to discover a sungrazing comet online by downloading images accumulated by some satellite observatories such as SOHO. SOHO's 2000th comet was discovered by Polish amateur astronomer Michał Kusiak on 26 December 2010 and both discoverers of Hale–Bopp used amateur equipment (although Hale was not an amateur). 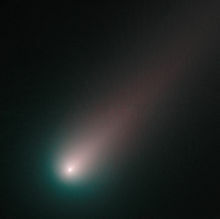 A number of periodic comets discovered in earlier decades or previous centuries are now lost comets. Their orbits were never known well enough to predict future appearances or the comets have disintegrated. However, occasionally a "new" comet is discovered, and calculation of its orbit shows it to be an old "lost" comet. An example is Comet 11P/Tempel–Swift–LINEAR, discovered in 1869 but unobservable after 1908 because of perturbations by Jupiter. It was not found again until accidentally rediscovered by LINEAR in 2001. There are at least 18 comets that fit this category. The depiction of comets in popular culture is firmly rooted in the long Western tradition of seeing comets as harbingers of doom and as omens of world-altering change. Halley's Comet alone has caused a slew of sensationalist publications of all sorts at each of its reappearances. It was especially noted that the birth and death of some notable persons coincided with separate appearances of the comet, such as with writers Mark Twain (who correctly speculated that he'd "go out with the comet" in 1910) and Eudora Welty, to whose life Mary Chapin Carpenter dedicated the song "Halley Came to Jackson". In times past, bright comets often inspired panic and hysteria in the general population, being thought of as bad omens. 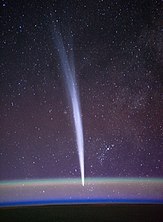 More recently, during the passage of Halley's Comet in 1910, the Earth passed through the comet's tail, and erroneous newspaper reports inspired a fear that cyanogen in the tail might poison millions, whereas the appearance of Comet Hale–Bopp in 1997 triggered the mass suicide of the Heaven's Gate cult. In science fiction, the impact of comets has been depicted as a threat overcome by technology and heroism (as in the 1998 films Deep Impact and Armageddon), or as a trigger of global apocalypse (Lucifer's Hammer, 1979) or zombies (Night of the Comet, 1984). In Jules Verne's Off on a Comet a group of people are stranded on a comet orbiting the Sun, while a large manned space expedition visits Halley's Comet in Sir Arthur C. Clarke's novel 2061: Odyssey Three. ^ Randall, Lisa (2015). Dark Matter and the Dinosaurs: The Astounding Interconnectedness of the Universe. New York: Ecco/HarperCollins Publishers. pp. 104–105. ISBN 978-0-06-232847-2. ^ "What is the difference between asteroids and comets". Rosetta's Frequently Asked Questions. European Space Agency. Retrieved 30 July 2013. ^ "What Are Asteroids And Comets". Near Earth Object Program FAQ. NASA. Retrieved 30 July 2013. ^ Ishii, H. A.; Bradley, J. P.; Dai, Z. R.; Chi, M.; Kearsley, A. T.; Burchell, M. J.; Browning, N. D.; Molster, F. (2008). "Comparison of Comet 81P/Wild 2 Dust with Interplanetary Dust from Comets". Science. 319 (5862): 447–50. Bibcode:2008Sci...319..447I. doi:10.1126/science.1150683. PMID 18218892. ^ "JPL Small-Body Database Browser C/2014 S3 (PANSTARRS)". ^ Stephens, Haynes; Meech, Karen Jean; Kleyna, Jan; Keane, Jacqueline; Hainaut, Olivier; Yang, Bin; Wainscoat, Richard J.; Micheli, Marco; Bhatt, Bhuwan; Sahu, Devendra (2017). "Chasing Manxes: Long-Period Comets Without Tails". AAA/Division for Planetary Sciences Meeting Abstracts #49: 420.02. Bibcode:2017DPS....4942002S. ^ Johnston, Robert (2 August 2014). "Known populations of solar system objects". Retrieved 19 January 2015. ^ Erickson, Jon (2003). Asteroids, Comets, and Meteorites: Cosmic Invaders of the Earth. The Living Earth. New York: Infobase. p. 123. ISBN 978-0-8160-4873-1. ^ Couper, Heather; Dinwiddie, Robert; Farndon, John; Henbest, Nigel; Hughes, David W.; Sparrow, Giles; Stott, Carole; Stuart, Colin (2014). The Planets: The Definitive Guide to Our Solar System. London: Dorling Kindersley. p. 222. ISBN 978-1-4654-3573-6. ^ Licht, A (1999). "The Rate of Naked-Eye Comets from 101 BC to 1970 AD". Icarus. 137 (2): 355. Bibcode:1999Icar..137..355L. doi:10.1006/icar.1998.6048. ^ "Touchdown! Rosetta's Philae Probe Lands on Comet". European Space Agency. 12 November 2014. Retrieved 11 December 2017. ^ Harper, Douglas. "Comet (n.)". Online Etymology Dictionary. Retrieved 30 July 2013. ^ The Encyclopedia Americana: A Library of Universal Knowledge. 26. The Encyclopedia Americana Corp. 1920. pp. 162–163. ^ "Dirty Snowballs in Space". Starryskies. Archived from the original on 29 January 2013. Retrieved 15 August 2013. ^ "Evidence from ESA's Rosetta Spacecraft Suggests that Comets are more "Icy Dirtball" than "Dirty Snowball"". Times Higher Education. 21 October 2005. ^ a b Clavin, Whitney (10 February 2015). "Why Comets Are Like Deep Fried Ice Cream". NASA. Retrieved 10 February 2015. ^ Meech, M. (24 March 1997). "1997 Apparition of Comet Hale–Bopp: What We Can Learn from Bright Comets". Planetary Science Research Discoveries. Retrieved 30 April 2013. ^ "Stardust Findings Suggest Comets More Complex Than Thought". NASA. 14 December 2006. Retrieved 31 July 2013. ^ Elsila, Jamie E.; Glavin, Daniel P.; Dworkin, Jason P. (2009). "Cometary glycine detected in samples returned by Stardust". Meteoritics & Planetary Science. 44 (9): 1323. Bibcode:2009M&PS...44.1323E. doi:10.1111/j.1945-5100.2009.tb01224.x. ^ Callahan, M. P.; Smith, K. E.; Cleaves, H. J.; Ruzicka, J.; Stern, J. C.; Glavin, D. P.; House, C. H.; Dworkin, J. P. (2011). "Carbonaceous meteorites contain a wide range of extraterrestrial nucleobases". Proceedings of the National Academy of Sciences. 108 (34): 13995–8. Bibcode:2011PNAS..10813995C. doi:10.1073/pnas.1106493108. PMC 3161613. PMID 21836052. ^ Steigerwald, John (8 August 2011). "NASA Researchers: DNA Building Blocks Can Be Made in Space". NASA. Retrieved 31 July 2013. ^ a b Weaver, H. A.; Feldman, PD; a'Hearn, MF; Arpigny, C; Brandt, JC; Festou, MC; Haken, M; McPhate, JB; Stern, SA; Tozzi, GP (1997). "The Activity and Size of the Nucleus of Comet Hale-Bopp (C/1995 O1)". Science. 275 (5308): 1900–4. Bibcode:1997Sci...275.1900W. doi:10.1126/science.275.5308.1900. PMID 9072959. ^ Hanslmeier, Arnold (2008). Habitability and Cosmic Catastrophes. p. 91. ISBN 978-3-540-76945-3. ^ Fernández, Yanga R. (2000). "The Nucleus of Comet Hale-Bopp (C/1995 O1): Size and Activity". Earth, Moon, and Planets. 89: 3. Bibcode:2002EM&P...89....3F. doi:10.1023/A:1021545031431. ^ "The Cometary Nucleus". Department of Earth and Space Sciences, UCLA. April 2003. Retrieved 31 July 2013. ^ "SOHO's new catch: its first officially periodic comet". European Space Agency. Retrieved 16 August 2013. ^ a b c d Britt, D. T.; Consolmagno, G. J.; Merline, W. J. (2006). "Small Body Density and Porosity: New Data, New Insights" (PDF). 37th Annual Lunar and Planetary Science Conference. 37: 2214. Bibcode:2006LPI....37.2214B. ^ "The Geology of Small Bodies". NASA. Retrieved 15 August 2013. ^ a b c Whitman, K; Morbidelli, A; Jedicke, R (2006). "The size–frequency distribution of dormant Jupiter family comets". Icarus. 183: 101. arXiv:astro-ph/0603106v2. Bibcode:2006Icar..183..101W. doi:10.1016/j.icarus.2006.02.016. ^ Agle, DC; Brown, Dwayne; Fohn, Joe; Bauer, Markus (2 June 2015). "NASA Instrument on Rosetta Makes Comet Atmosphere Discovery". NASA. Retrieved 2 June 2015. ^ Feldman, Paul D.; A'Hearn, Michael F.; Bertaux, Jean-Loup; Feaga, Lori M.; Parker, Joel Wm. ; Schindhelm, Eric; Steiffl, Andrew J.; Stern, S. Alan; Weaver, Harold A.; Sierks, Holger; Vincent, Jean-Baptiste (2 June 2015). "Measurements of the near-nucleus coma of comet 67P/Churyumov-Gerasimenko with the Alice far-ultraviolet spectrograph on Rosetta" (PDF). Astronomy and Astrophysics. 583: A8. arXiv:1506.01203. Bibcode:2015A&A...583A...8F. doi:10.1051/0004-6361/201525925. Retrieved 3 June 2015. ^ Halley: Using the volume of an ellipsoid of 15×8×8 km * a rubble pile density of 0.6 g/cm3 yields a mass (m=d*v) of 3.02E+14 kg. 81P/Wild: Using the volume of an ellipsoid of 5.5x4.0x3.3 km * a density of 0.6 g/cm3 yields a mass of 2.28E+13 kg. ^ "What Have We Learned About Halley's Comet?". Astronomical Society of the Pacific. 1986. Retrieved 4 October 2013. ^ Sagdeev, R. Z.; Elyasberg, P. E.; Moroz, V. I. (1988). "Is the nucleus of Comet Halley a low density body?". Nature. 331 (6153): 240. Bibcode:1988Natur.331..240S. doi:10.1038/331240a0. ISSN 0028-0836. ^ "9P/Tempel 1". JPL. Retrieved 16 August 2013. ^ "Comet vital statistics". European Space Agency. 22 January 2015. Retrieved 24 January 2015. ^ "Hubble's Last Look at Comet ISON Before Perihelion". ESA/Hubble Press Release. Retrieved 20 November 2013. ^ Clay Sherrod, P. Clay; Koed, Thomas L. (2003). A Complete Manual of Amateur Astronomy: Tools and Techniques for Astronomical Observations. p. 66. ISBN 978-0-486-15216-5. ^ a b Combi, Michael R.; Harris, Walter M.; Smyth, William H. (2004). "Gas dynamics and kinetics in the cometary coma: Theory and observations" (PDF). Comets II: 523. Bibcode:2004come.book..523C. ^ Morris, Charles S. "Comet Definitions". Michael Gallagher. Retrieved 31 August 2013. ^ Lallement, Rosine; Bertaux, Jean-Loup; Szegö, Karöly; Nemeth, Szilvia (2002). "The Shadow of Comet Hale–Bopp in Lyman-Alpha". Earth, Moon, and Planets. 90: 67–76. doi:10.1023/A:1021512317744. ^ a b Jewitt, David. 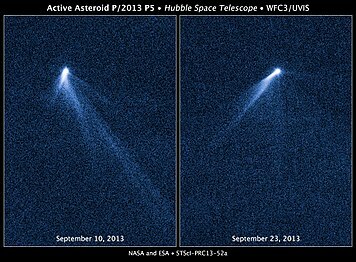 "The Splintering of Comet 17P/Holmes During a Mega-Outburst". University of Hawaii. Retrieved 30 August 2013. ^ a b c Kronk, Gary W. "The Comet Primer". Gary W. Kronk's Cometography. Archived from the original on 17 May 2011. Retrieved 30 August 2013. ^ a b Brinkworth, Carolyn; Thomas, Claire. "Comets". University of Leicester. Retrieved 31 July 2013. ^ Pasachoff, Jay M (2000). A field guide to the stars and planets. p. 75. ISBN 978-0-395-93432-6. ^ Jewitt, David. "Comet Holmes Bigger Than The Sun". Institute for Astronomy at the University of Hawaii. Retrieved 31 July 2013. ^ Lisse, C. M.; Dennerl, K.; Englhauser, J.; Harden, M.; Marshall, F. E.; Mumma, M. J.; Petre, R.; Pye, J. P.; Ricketts, M. J.; Schmitt, J.; Trumper, J.; West, R. G. (1996). 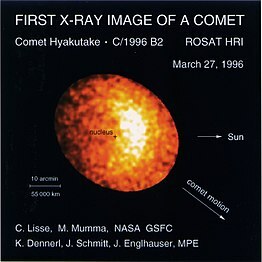 "Discovery of X-ray and Extreme Ultraviolet Emission from Comet C/Hyakutake 1996 B2". Science. 274 (5285): 205. Bibcode:1996Sci...274..205L. doi:10.1126/science.274.5285.205. ^ Lisse, C. M.; Christian, DJ; Dennerl, K; Meech, KJ; Petre, R; Weaver, HA; Wolk, SJ (2001). "Charge Exchange-Induced X-Ray Emission from Comet C/1999 S4 (LINEAR)". Science. 292 (5520): 1343–8. Bibcode:2001Sci...292.1343L. doi:10.1126/science.292.5520.1343. PMID 11359004. ^ Jones, D. E.; et al. (March 1986). "The Bow wave of Comet Giacobini-Zinner – ICE magnetic field observations". Geophysical Research Letters. 13: 243–246. Bibcode:1986GeoRL..13..243J. doi:10.1029/GL013i003p00243. ^ Gringauz, K. I.; et al. (15 May 1986). "First in situ plasma and neutral gas measurements at comet Halley". Nature. 321: 282–285. Bibcode:1986Natur.321..282G. doi:10.1038/321282a0. ^ Neubauer, F. M.; et al. (February 1993). "First results from the Giotto magnetometer experiment during the P/Grigg-Skjellerup encounter". Astronomy and Astrophysics. 268 (2): L5–L8. Bibcode:1993A&A...268L...5N. ^ Gunell, H.; et al. (November 2018). "The infant bow shock: a new frontier at a weak activity comet". Astronomy and Astrophysics. 619. L2. doi:10.1051/0004-6361/201834225. ^ Cochran, Anita L.; Levison, Harold F.; Stern, S. Alan; Duncan, Martin J. (1995). "The Discovery of Halley-sized Kuiper Belt Objects Using the Hubble Space Telescope". Astrophysical Journal. 455: 342. arXiv:astro-ph/9509100. Bibcode:1995ApJ...455..342C. doi:10.1086/176581. ^ Cochran, Anita L.; Levison, Harold F.; Tamblyn, Peter; Stern, S. Alan; Duncan, Martin J. (1998). "The Calibration of the Hubble Space Telescope Kuiper Belt Object Search:Setting the Record Straight". The Astrophysical Journal. 503: L89. arXiv:astro-ph/9806210. Bibcode:1998ApJ...503L..89C. doi:10.1086/311515. ^ Brown, Michael E.; Kulkarni, Shrinivas R.; Liggett, Timothy J. (1997). "An Analysis of the Statistics of the \ITAL Hubble Space Telescope\/ITAL] Kuiper Belt Object Search". The Astrophysical Journal. 490: L119. Bibcode:1997ApJ...490L.119B. doi:10.1086/311009. ^ Jewitt, David; Luu, Jane; Chen, Jun (1996). "The Mauna Kea-Cerro-Tololo (MKCT) Kuiper Belt and Centaur Survey". Astronomical Journal. 112: 1225. Bibcode:1996AJ....112.1225J. doi:10.1086/118093. ^ Lang, Kenneth R. (2011). The Cambridge Guide to the Solar System. p. 422. ISBN 978-1-139-49417-5. ^ Nemiroff, R.; Bonnell, J., eds. (29 June 2013). "PanSTARRS: The Anti Tail Comet". Astronomy Picture of the Day. NASA. Retrieved 31 July 2013. ^ a b Carroll, B. W.; Ostlie, D. A. (1996). An Introduction to Modern Astrophysics. Addison-Wesley. pp. 864–874. ISBN 0-201-54730-9. ^ Eyles, C. J.; Harrison, R. A.; Davis, C. J.; Waltham, N. R.; Shaughnessy, B. M.; Mapson-Menard, H. C. A.; Bewsher, D.; Crothers, S. R.; Davies, J. A.; Simnett, G. M.; Howard, R. A.; Moses, J. D.; Newmark, J. S.; Socker, D. G.; Halain, J.-P.; Defise, J.-M.; Mazy, E.; Rochus, P. (2008). "The Heliospheric Imagers Onboard the STEREO Mission". Solar Physics. 254 (2): 387. Bibcode:2009SoPh..254..387E. doi:10.1007/s11207-008-9299-0. hdl:2268/15675. ^ Staff (29 January 2013). "When A Planet Behaves Like A Comet". ESA. Retrieved 30 August 2013. ^ Kramer, Miriam (30 January 2013). "Venus Can Have 'Comet-Like' Atmosphere". Space.com. Retrieved 30 August 2013. ^ a b "Comets and Jets". Hubblesite.org. 12 November 2013. ^ Baldwin, Emily (11 November 2010). "Dry ice fuels comet jets". Astronomy Now. Archived from the original on 17 December 2013. ^ Chang, Kenneth (18 November 2010). "Comet Hartley 2 Is Spewing Ice, NASA Photos Show". The New York Times. ^ "The Orbit of a Comet". University of St Andrews. Retrieved 1 September 2013. ^ "Short-Period Comet". Amazing Space. Archived from the original on 31 July 2013. Retrieved 31 July 2013. ^ Delsemme, Armand H. (2001). Our Cosmic Origins: From the Big Bang to the Emergence of Life and Intelligence. p. 117. ISBN 978-0-521-79480-0. ^ Wilson, H. C. (1909). "The Comet Families of Saturn, Uranus and Neptune". Popular Astronomy. 17: 629–633. Bibcode:1909PA.....17..629W. ^ Dutch, Steven. "Comets". Natural and Applied Sciences, University of Wisconsin. Archived from the original on 29 July 2013. Retrieved 31 July 2013. ^ "The Jupiter Family Comets". Department of Terrestrial Magnetism Carnegie Institution of Washington. Retrieved 11 August 2013. ^ a b "Comets – where are they ?". British Astronomical Association. 6 November 2012. Archived from the original on 5 August 2013. Retrieved 11 August 2013. ^ a b c Duncan, Martin J. (2008). "Dynamical Origin of Comets and Their Reservoirs". Space Science Reviews. 138: 109. Bibcode:2008SSRv..138..109D. doi:10.1007/s11214-008-9405-5. ^ Jewitt, David C. (2002). "From Kuiper Belt Object to Cometary Nucleus: The Missing Ultrared Matter". The Astronomical Journal. 123 (2): 1039. Bibcode:2002AJ....123.1039J. doi:10.1086/338692. ^ "Constraints: orbital class (HTC)". JPL Small-Body Database. NASA. Retrieved 27 September 2018. ^ "Constraints: comets and orbital class (JFc)". JPL Small-Body Database. NASA. Retrieved 27 September 2018. ^ Reddy, Francis (3 April 2006). "New comet class in Earth's backyard". Astronomy. Retrieved 31 July 2013. ^ "Comets". The Pennsylvania State University. Retrieved 8 August 2013. ^ Koupelis, Theo (2010). In Quest of the Solar System. p. 246. ISBN 978-0-7637-9477-4. ^ Davidsson, Björn J. R. (2008). "Comets – Relics from the birth of the Solar System". Uppsala University. Retrieved 30 July 2013. ^ Oort, J. H. (1950). 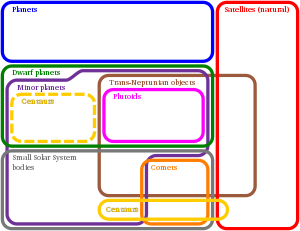 "The structure of the cloud of comets surrounding the Solar System and a hypothesis concerning its origin". Bulletin of the Astronomical Institutes of the Netherlands. 11: 91. Bibcode:1950BAN....11...91O. ^ Hanslmeier, Arnold (2008). Habitability and Cosmic Catastrophes. p. 152. ISBN 978-3-540-76945-3. ^ a b c "Small Bodies: Profile". NASA/JPL. 29 October 2008. Retrieved 11 August 2013. ^ Elenin, Leonid (7 March 2011). "Influence of giant planets on the orbit of comet C/2010 X1". Retrieved 11 August 2013. ^ Joardar, S; Bhattacharya, A. B; Bhattacharya, R (2008). Astronomy and Astrophysics. p. 21. ISBN 978-0-7637-7786-9. ^ Chebotarev, G. A. (1964). "Gravitational Spheres of the Major Planets, Moon and Sun". Soviet Astronomy. 7: 618. Bibcode:1964SvA.....7..618C. ^ "JPL Small-Body Database Search Engine: e > 1". JPL. Retrieved 13 August 2013. ^ Gohd, Chelsea (27 June 2018). "Interstellar Visitor 'Oumuamua Is a Comet After All". Space.com. Retrieved 27 September 2018. ^ "C/1980 E1 (Bowell)". JPL Small-Body Database (1986-12-02 last obs). Retrieved 13 August 2013. ^ "Comet". Encyclopædia Britannica Online. Retrieved 13 August 2013. ^ McGlynn, Thomas A.; Chapman, Robert D. (1989). "On the nondetection of extrasolar comets". The Astrophysical Journal. 346: L105. Bibcode:1989ApJ...346L.105M. doi:10.1086/185590. ^ "JPL Small-Body Database Search Engine: e > 1 (sorted by name)". JPL. Retrieved 27 September 2018. ^ a b Harold F. Levison; Luke Donnes (2007). "Comet Populations and Cometary Dynamics". In Lucy Ann Adams McFadden; Lucy-Ann Adams; Paul Robert Weissman; Torrence V. Johnson. Encyclopedia of the Solar System (2nd ed.). Amsterdam; Boston: Academic Press. pp. 575–588. ISBN 0-12-088589-1. ^ Randall, Lisa (2015). Dark matter and the dinosaurs: The astounding interconnectedness of the universe. Harper Collins Publishers. p. 115. ISBN 978-0-06-232847-2. ^ a b Jack G. Hills (1981). "Comet showers and the steady-state infall of comets from the Oort Cloud". Astronomical Journal. 86: 1730–1740. Bibcode:1981AJ.....86.1730H. doi:10.1086/113058. ^ Harold F. Levison; Luke Dones; Martin J. Duncan (2001). "The Origin of Halley-Type Comets: Probing the Inner Oort Cloud". Astronomical Journal. 121 (4): 2253–2267. Bibcode:2001AJ....121.2253L. doi:10.1086/319943. ^ Thomas M. Donahue, ed. (1991). Planetary Sciences: American and Soviet Research, Proceedings from the U.S.–U.S.S.R. Workshop on Planetary Sciences. Kathleen Kearney Trivers, and David M. Abramson. National Academy Press. p. 251. ISBN 0-309-04333-6. Retrieved 18 March 2008. ^ Julio A. Fernéndez (1997). "The Formation of the Oort Cloud and the Primitive Galactic Environment" (PDF). Icarus. 219: 106–119. Bibcode:1997Icar..129..106F. doi:10.1006/icar.1997.5754. Retrieved 18 March 2008. ^ a b Sanders, Robert (7 January 2013). "Exocomets may be as common as exoplanets". UC Berkeley. Retrieved 30 July 2013. ^ a b "'Exocomets' Common Across Milky Way Galaxy". Space.com. 7 January 2013. Archived from the original on 16 September 2014. Retrieved 8 January 2013. ^ Beust, H.; Lagrange-Henri, A.M.; Vidal-Madjar, A.; Ferlet, R. (1990). "The Beta Pictoris circumstellar disk. X – Numerical simulations of infalling evaporating bodies". Astronomy and Astrophysics. 236: 202–216. Bibcode:1990A&A...236..202B. ISSN 0004-6361. ^ a b "Major Meteor Showers". 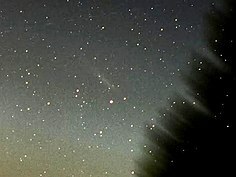 Meteor Showers Online. Retrieved 31 July 2013. ^ Muir, Hazel (25 September 2007). "Earth's water brewed at home, not in space". New Scientist. Retrieved 30 August 2013. ^ Fernández, Julio A. (2006). Comets. p. 315. ISBN 978-1-4020-3495-4. ^ Martins, Zita; Price, Mark C.; Goldman, Nir; Sephton, Mark A.; Burchell, Mark J. (2013). "Shock synthesis of amino acids from impacting cometary and icy planet surface analogues". Nature Geoscience. 6: 1045–1049. Bibcode:2013NatGe...6.1045M. doi:10.1038/ngeo1930. ^ "Water Discovered in Apollo Moon Rocks Likely Came from Comets". NASA. Retrieved 7 September 2013. ^ "Australites". Museum Victoria. Retrieved 7 September 2013. ^ a b Ley, Willy (October 1967). "The Worst of All the Comets". For Your Information. Galaxy Science Fiction. Vol. 26 no. 1. pp. 96–105. ^ Arthusius, Gothard (1619). Cometa orientalis: Kurtze vnd eygentliche Beschreibung deß newen Cometen, so im November deß abgelauffenen 1618. Franckfurt-am-Mayn: Sigismund Latomus – via Gallica.fr. ^ "Yerkes Observatory Finds Cyanogen in Spectrum of Halley's Comet". The New York Times. 8 February 1910. Retrieved 8 January 2018. ^ Coffey, Jerry (20 September 2009). "Interesting Facts About Comets". Universe Today. Retrieved 8 January 2018. ^ Hughes, D. W. (1991). "On hyperbolic comets". Journal of the British Astronomical Association. 101: 119. Bibcode:1991JBAA..101..119H. ^ Lyzenga, Greg (16 November 1998). "If comets melt, why do they seem to last for long periods of time". Scientific American. Retrieved 13 August 2013. ^ Bottke Jr, William F.; Levison, Harold F. (2002). "Evolution of Comets into Asteroids" (PDF). Asteroids III: 669. Bibcode:2002aste.book..669W. ^ Davies, J. 1986. Are the IRAS-detected Apollo asteroids extinct comets? Mon. Not. R. astr. Soc: 221, 19–23. ^ McFadden, L., et al. 1993. The Enigmatic Object 2201 Oljato: Is it an Asteroid or an Evolved Comet? Journal of Geophysical Research: 98, 3031–3041. ^ Whitehouse, David (26 July 2002). "Astronomers see comet break-up". BBC News. ^ Kronk, Gary W. "D/1993 F2 Shoemaker–Levy 9". Gary W. Kronk's Cometography. Archived from the original on 9 May 2008. Retrieved 27 April 2009. ^ "Comet Shoemaker–Levy Background". JPL. Retrieved 23 September 2013. ^ Whitney, Clavin (10 May 2006). "Spitzer Telescope Sees Trail of Comet Crumbs". Retrieved 16 August 2013. ^ a b Yeomans, Donald K. (April 2007). "Great Comets in History". JPL. Retrieved 16 August 2013. ^ Boehnhardt, H. (2004). "Split comets" (PDF). Comets II: 301. Bibcode:2004come.book..301B. ^ Pittichova, Jand; Meech, Karen J.; Valsecchi, Giovanni B.; Pittich, Eduard M. (2003). "Are Comets 42P/Neujmin 3 and 53P/Van Biesbroeck Parts of one Comet?". Bulletin of the American Astronomical Society. 35: 1011. Bibcode:2003DPS....35.4705P. ^ "The Andromedids". Meteor Showers Online. Retrieved 27 April 2009. ^ "SOHO analyses a kamikaze comet". ESA. 23 February 2001. Retrieved 30 August 2013. ^ "Comet Shoemaker–Levy 9 Collision with Jupiter". National Space Science Data Center. Retrieved 30 August 2013. ^ Harrington, J.D. ; Villard, Ray (6 March 2014). "RELEASE 14-060 NASA's Hubble Telescope Witnesses Asteroid's Mysterious Disintegration". NASA. Retrieved 6 March 2014. ^ Ridpath, Ian (3 July 2008). "Halley and his Comet". A brief history of Halley's Comet. Retrieved 14 August 2013. ^ Kronk, Gary W. "2P/Encke". Gary W. Kronk's Cometography. Retrieved 14 August 2013. ^ Kronk, Gary W. "3D/Biela". Gary W. Kronk's Cometography. Retrieved 14 August 2013. ^ a b "Comet Names and Designations; Comet Naming and Nomenclature; Names of Comets". Harvard University. Retrieved 7 September 2013. ^ "Chinese Oracle Bones". Cambridge University Library. Retrieved 14 August 2013. ^ Ridpath, Ian (8 July 2008). "Comet lore". A brief history of Halley's Comet. Retrieved 14 August 2013. ^ Kelley, David H.; Milone, Eugene F. (2011). Exploring Ancient Skies: A Survey of Ancient and Cultural Astronomy (2nd ed.). Springer Science+Business Media. p. 293. doi:10.1007/978-1-4419-7624-6. ISBN 978-1-4419-7624-6. OCLC 710113366. ^ "A Brief History of Comets I (until 1950)". European Southern Observatory. Retrieved 14 August 2013. ^ Newton, Isaac (1687). "Lib. 3, Prop. 41". Philosophiæ Naturalis Principia Mathematica. Royal Society of London. ISBN 0-521-07647-1. ^ Halleio, E. (1704). "Astronomiae Cometicae Synopsis, Autore Edmundo Halleio apud Oxonienses. Geometriae Professore Saviliano, & Reg. Soc. S" (PDF). Philosophical Transactions of the Royal Society of London. 24 (289–304): 1882. doi:10.1098/rstl.1704.0064. de l'Isle (June 1759) "Lettre de M. de l'Isle … contenant la découverte du retour de la Comète de 1682, … " (Letter from Mr. de l'Isle … containing the discovery of the return of the comet of 1682), Le Journal des Sçavans, pp. 356–364. Clairaut, Théorie du mouvement des comètes, … [Theory of the movement of comets, …] (Paris, France: Michel Lambert, 1760); see especially the preface. ^ Wong, Yau-Chuen (2008). The Greatest Comets in History: Broom Stars and Celestial Scimitars. p. 35. ISBN 978-0-387-09513-4. ^ McKillop, Alan Dugald (1942). The Background of Thomson's Seasons. p. 67. ISBN 978-0-8166-5950-0. ^ Whipple, F. L. (1950). "A comet model. I. The acceleration of Comet Encke". The Astrophysical Journal. 111: 375. Bibcode:1950ApJ...111..375W. doi:10.1086/145272. ^ Calder, Nigel (13 October 2005). Magic Universe:A Grand Tour of Modern Science. p. 156. ISBN 978-0-19-162235-9. ^ Küppers, Michael; O'Rourke, Laurence; Bockelée-Morvan, Dominique; Zakharov, Vladimir; Lee, Seungwon; von Allmen, Paul; Carry, Benoît; Teyssier, David; Marston, Anthony; Müller, Thomas; Crovisier, Jacques; Barucci, M. Antonietta; Moreno, Raphael (2014). "Localized sources of water vapour on the dwarf planet (1) Ceres". Nature. 505 (7484): 525–527. Bibcode:2014Natur.505..525K. doi:10.1038/nature12918. ISSN 0028-0836. PMID 24451541. ^ a b Harrington, J.D. (22 January 2014). "Herschel Telescope Detects Water on Dwarf Planet – Release 14-021". NASA. Retrieved 22 January 2014. ^ Zubritsky, Elizabeth; Neal-Jones, Nancy (11 August 2014). "RELEASE 14-038 – NASA's 3-D Study of Comets Reveals Chemical Factory at Work". NASA. Retrieved 12 August 2014. ^ Cordiner, M.A. ; et al. (11 August 2014). "Mapping the Release of Volatiles in the Inner Comae of Comets C/2012 F6 (Lemmon) and C/2012 S1 (ISON) Using the Atacama Large Millimeter/Submillimeter Array". The Astrophysical Journal. 792 (1): L2. arXiv:1408.2458. Bibcode:2014ApJ...792L...2C. doi:10.1088/2041-8205/792/1/L2. Retrieved 12 August 2014. ^ "NASA Spacecraft Finds Comet Has Hot, Dry Surface". JPL. 5 April 2002. Retrieved 22 August 2013. 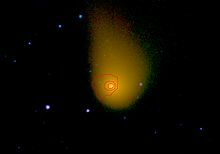 ^ "NASA's 'Deep Impact' Team Reports First Evidence of Cometary Ice". Brown University. 2 February 2006. Retrieved 22 August 2013. ^ Rincon, Paul (14 March 2006). "Comets 'are born of fire and ice'". BBC News. Retrieved 7 September 2013. ^ Malik, T. (13 March 2006). "NASA's Stardust Comet Samples Contain Minerals Born in Fire". Space.com. Retrieved 7 September 2013. ^ Van Boekel, R.; Min, M.; Leinert, Ch. ; Waters, L.B.F.M. ; Richichi, A.; Chesneau, O.; Dominik, C.; Jaffe, W.; Dutrey, A.; Graser, U.; Henning, Th. ; De Jong, J.; Köhler, R.; De Koter, A.; Lopez, B.; Malbet, F.; Morel, S.; Paresce, F.; Perrin, G.; Preibisch, Th. ; Przygodda, F.; Schöller, M.; Wittkowski, M. (2004). "The building blocks of planets within the 'terrestrial' region of protoplanetary disks". Nature. 432 (7016): 479–82. Bibcode:2004Natur.432..479V. doi:10.1038/nature03088. PMID 15565147. ^ "Stardust comet dust resembles asteroid materials". Lawrence Livermore National Laboratory. 24 January 2008. Archived from the original on 28 May 2010. Retrieved 7 September 2013. ^ Dunham, Will (25 January 2008). "Dust samples prompt rethink about comets". Reuters. Retrieved 7 September 2013. ^ "Rosetta Ready To Explore A Comet's Realm". ESA. 12 January 2004. Retrieved 7 September 2013. ^ Famighetti, Robert (1995). The World Almanac and Book of Facts 1996. p. 274. ISBN 978-0-88687-780-4. ^ Atkinson, Nancy. "New 'Sun-Skirting' Comet Could Provide Dazzling Display in 2013". Universe Today. Retrieved 7 September 2013. ^ Kronk, Gary W. "C/1975 V1 (West)". Gary W. Kronk's Cometography. Retrieved 7 September 2013. 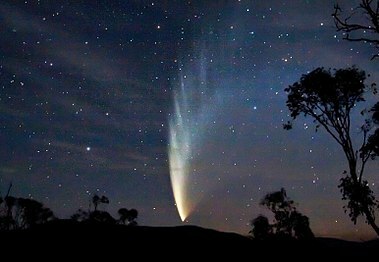 ^ "Great Moments in Comet History: Comet McNaught". Hubblesite. Retrieved 15 August 2013. ^ Mobberley, Martin (2010). Hunting and Imaging Comets. p. 34. ISBN 978-1-4419-6905-7. ^ Opik, E. J. (1966). "Sun-Grazing Comets and Tidal Disruption". Irish Astronomical Journal. 7: 141. Bibcode:1966IrAJ....7..141O. ^ Hahn, M. E.; Chambers, J. E.; Hahn, G. (1992). "Origin of sungrazers: a frequent cometary end-state". Astronomy and Astrophysics. 257 (1): 315–322. Bibcode:1992A&A...257..315B. ^ Yoshikawa, K.; Nakano, S.; Yoshikawa, M. (2003). "On the Association among Periodic Comet 96P/Machholz, Arietids, the Marsden Comet Group, and the Kracht Comet Group" (PDF). Publications of the Astronomical Society of Japan. 55 (1): 321–324. Bibcode:2003PASJ...55..321O. doi:10.1093/pasj/55.1.321. ^ Kronk, Gary W. "29P/Schwassmann–Wachmann 1". Gary W. Kronk's Cometography. Retrieved 22 September 2013. ^ Kronk, Gary W. "95P/Chiron". Gary W. Kronk's Cometography. Retrieved 27 April 2009. ^ Kronk, Gary W. "137P/Shoemaker–Levy 2". Gary W. Kronk's Cometography. Retrieved 27 April 2009. ^ Y-J. Choi, P.R. Weissman, and D. Polishook (60558) 2000 EC_98, IAU Circ., 8656 (Jan. 2006), 2. ^ Pappalardo, Bob; Spiker, Linda (15 March 2009). "Cassini Proposed Extended-Extended Mission (XXM)" (PDF). Lunar and Planetary Institute. Archived (PDF) from the original on 18 July 2012. ^ Farmer, Steve E. Jr. "Getting Started – SOHO Comet Hunting Techniques/Instructions". Red Barn Observatory. Archived from the original on 21 May 2013. Retrieved 25 August 2013. ^ "SOHO". NASA. 28 December 2010. Retrieved 25 August 2013. ^ Kronk, Gary W. "11P/Tempel–Swift–LINEAR". Gary W. Kronk's Cometography. Retrieved 27 April 2009. ^ Meyer, M. (2013). "Lost periodic comets". The Catalogue of Comet Discoveries. Retrieved 18 July 2015. ^ a b c d Bowdoin Van Riper, A (2002). Science in Popular Culture: A Reference Guide. pp. 27–29. ISBN 978-0-313-31822-1. ^ Ridpath, Ian (3 July 2008). "Awaiting the Comet". A brief history of Halley's Comet. Retrieved 15 August 2013. ^ Brin, David (6 December 1987). "The View From Halley's Comet : 2061: ODYSSEY THREE by Arthur C. Clarke". Los Angeles Times. Brandt, John C.; Chapman, Robert D. (2004). Introduction to Comets (2nd ed.). Cambridge University Press. ISBN 978-0-521-80863-7.